If you’re looking for a fun and picturesque event, there is a great option just a few miles from Lighthouse. The long-running Preakness Celebration Balloon Festival is one of many during the week-long series of special events celebrating the annual running of the Preakness Stakes, one of Baltimore’s oldest traditions and the 2nd jewel in thoroughbred horse racing’s prestigious Triple Crown. The Hot Air Balloon Festival has a long and colorful tradition going back 40 years. The event will run until Saturday at Turf Valley in Ellicott City. There will be family activities, handmade crafts, retail and food vendors, and live entertainment. Balloon related activities will include tethered hot air balloon rides, a walk-through of an inflated hot air balloon, pilot demonstrations, balloon launches and the nightly Balloon Glow at dusk. 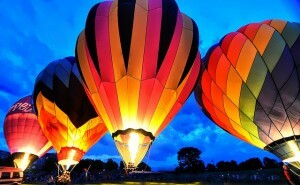 On Saturday, May 16th, the Balloon Festival will culminate with the launching of the balloons at 6:30 am. Festival activities will include four mass ascensions of hot air balloons. Balloon rides are available for additional fees, both for longer rides as well as shorter, tethered rides that go 60-80 feet up for a few minutes. There will be satellite parking at the Howard County Fairgrounds with frequent shuttles going back and forth, so keep this in mind depending how you will travel to the events. A fee of $10.00 per car load will be asked for parking, which will be collected by the Elkridge Adult Athletic Association and will support their community sponsored projects. For additional information, check out the event website or call the Festival Activities Information Hot Line — 410-465-1500 ext 2874.